On September 5th-7th, 2018, CAIDA will host an invitation-only workshop on interdisciplinary research of political events that affect the Internet and/or are partially visible through analysis of Internet measurement data. Arthur Blair (CyberDefcon), Lessons learned from SISSDEN darknets. Collection and analysis. Esteban Carisimo (Universidad de Buenos Aires), What is the influence of state-owned ASes in their national AS ecosystem? Philipp Winter (CAIDA/UC San Diego), Who shuts down the Internet and why? 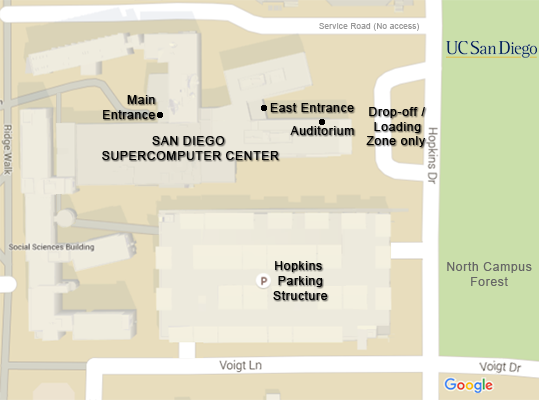 This workshop is being held in the SDSC East Building's Synthesis Center / Visualization Lab, Room B143-E.
From the Hopkins Structure, after setting your permit, take the elevators to the 2nd floor and walk safely out to Hopkins Dr. and the front of the Supercomputer Center. Walking past the Auditorium outside (and a sign reading "Halicioğlu Data Science Center"), go up the staircase to the entrance of the East building, and go through the double doors. Now inside the building, look under the staircase ahead to find Room B143-E, also labeled "Synthesis Center / Visualization Lab".